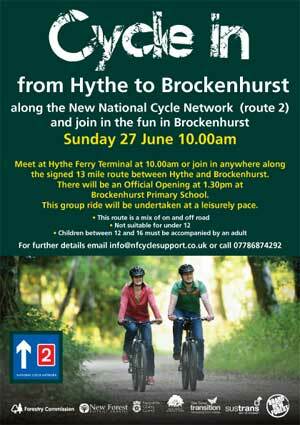 the signed 13 mile route between Hythe and Brockenhurst. This group ride will be undertaken at a leisurely pace. UPDATE: The first Hythe Ferry on a Sunday does not leave Town Quay until 10.00, the time the ride is due to start from Hythe! Chris Gregory at the National Park Authority will delay the start of the ride so as to meet the ferry and would-be cyclists at Hythe Pier.